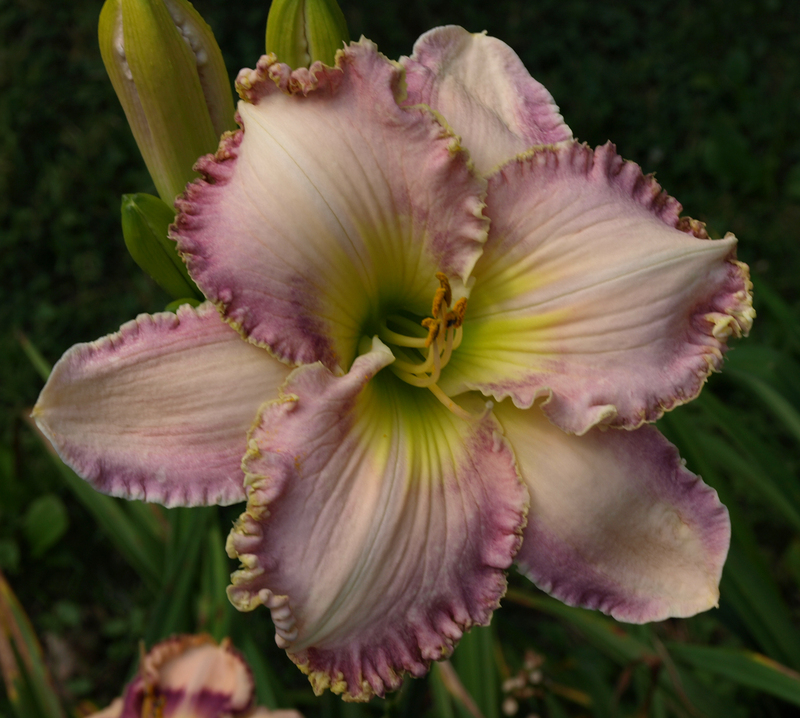 (Megan Skinner registered 2014 intro 2015) M DOR DIP H 26” W 4.5” Extended bloom, early morning opener, cold morning opener. Seedling F251 (seedling X seedling),19 buds on 4-way branching. Reblooms. Three outstanding traits of Fine Lavender Porcelain are its smooth, somewhat pearly, petal surface, its firm and very extended substance, and its strong dormancy. The combination of its flowers’ consistent smooth color and firmness earned it its garden nickname “porcelain”. Its petals are pinkish-lavender. The lavender eye divides into four zones – from the outside, a thin darker pink-lavender pencil edge, an equally thin cream, a medium-wide slate lavender, and a bottom layer of orange as the eye blends into the chartreuse throat. The midribs and petal edges are lighter, and the sepals have prominent cream edges and sepal tips. FLP, like its ancestor My Beloved Is Mine, is very dormant, starting each spring with tightly held perfect blue-green leaves, and it increases well. It sets pods voraciously. The pollen is fertile, but as with most early-morning openers, you have to collect it before it gets blotted by morning dew. In the past, we have found it difficult to cross either pearlescent and iridescent traits against patterned cultivars without suppressing one or both of the traits. Fine Lavender Porcelain succeeds in displaying both. 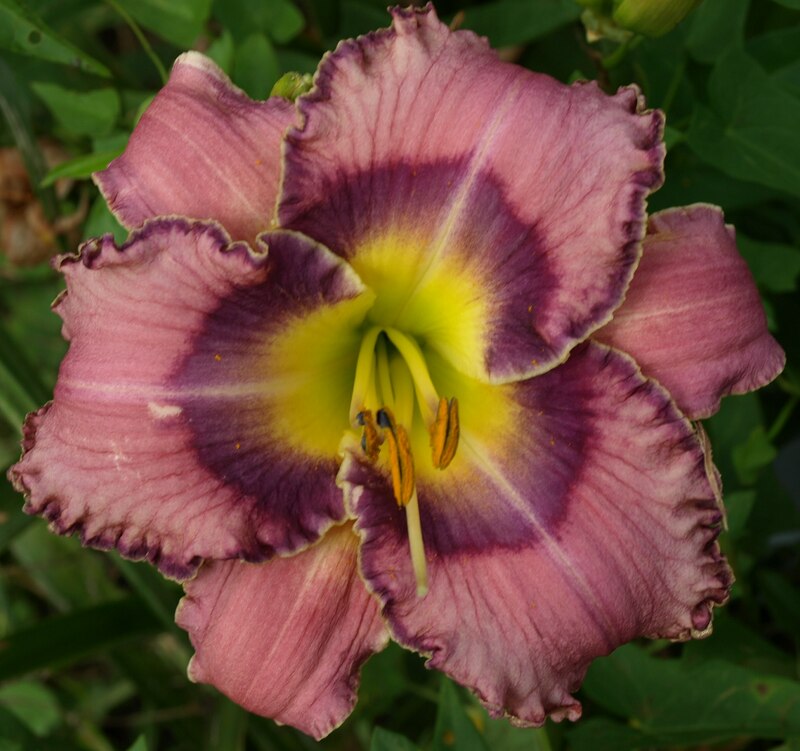 (Megan Skinner, registered 2014, intro 2015) Early, Dor, Tet, H 21, W 5, extended bloom, cold morning opening, early morning opening. Seedling A35 (America’s Most Wanted X Gold Futures), 24 buds on 3-way branching, reblooms. Earlybird Gold Currency is a gold self with ruffled petals, and slight radial relief grooves. Very hardy and vigorous in zone 6, fertile both ways (good pod setter), vigorous and good clumper. Combines the spring hardiness, early-season bloom, rebloom, cold morning opening and extended bloom I look for in Earlybird candidates. (Ron Skinner, registered 2014, intro 2015) Early, Dor, Tet H 25, W 5.5, seedling C68 (Chocolate Frosting X Tierra Del Fuego), 10 buds on 2 branches. 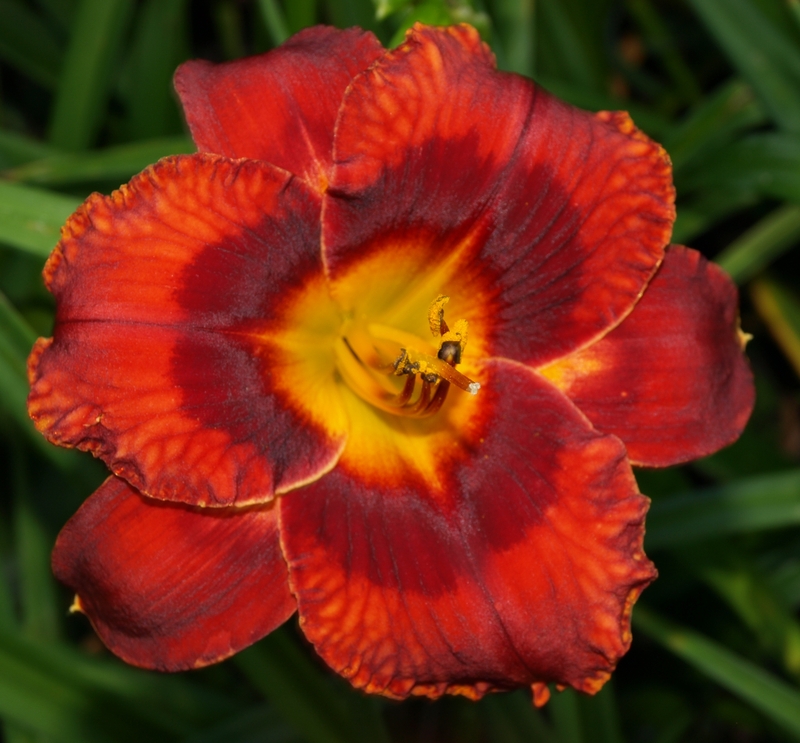 Flaming Paprikash has an iridescent deep red eye, which highlights the medium orange-red petals with darker veins and gold wire edge. It’s named after its grandmother, Pumpkin Paprikash. Fertile both ways. Makes a colorful dark contrast in the garden. (Megan Skinner, registered 2014, intro 2015) M DOR TET, H30, W5, diurnal. Seedling A227 (Forestlake Point Lace X Lace Cookies), 9 buds on 2-way branching. Sculpted – pleated. 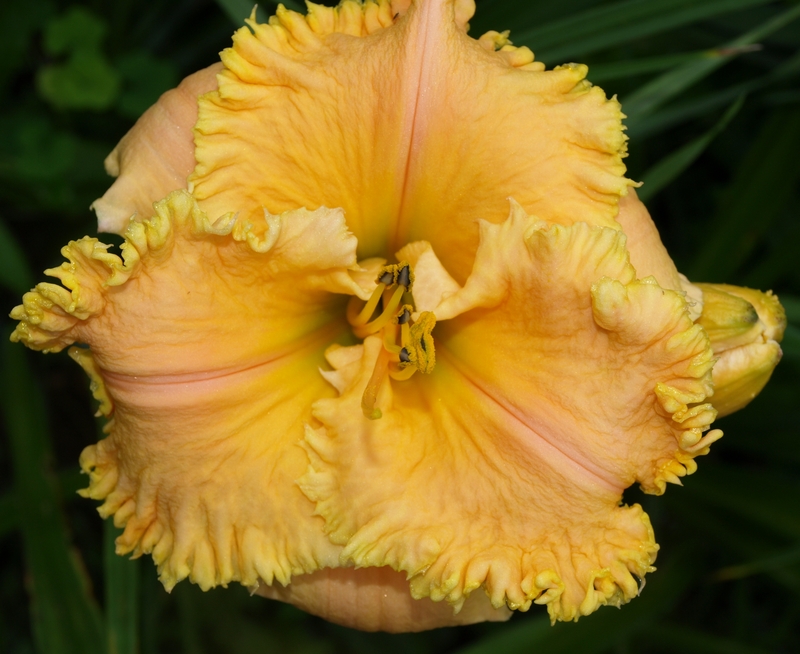 Apricot Fizz is a cross of two early-season daylilies, a central Virginia dormant from Fran Harding and a Florida evergreen from Matt Kaskel. The result was more beautiful than either parent, which is wonderful, but also later than either parent, which wasn’t great for my extra-early obsession. This wide petalled polychrome gives an apricot impression. 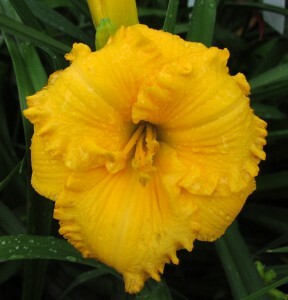 Its deep ruffled and toothed edges are yellow, as is its watermark. The light pink midrib is wide and pleated, with an inner rose strip the whole length of the midrib. The rest of the petal surface is highlighted by moderate relief, and the sepals match the light pink of the midrib. Apricot Fizz is fertile both ways, and passes on its deep ruffles and sculpted shape. (Ron Skinner, registered 2014, intro 2015) MLa, Dor Tet, H 37, W 6.75, extended, early morning opener, cold morning opener. Seedling C269 ((Enchanted April x Amanda’s Intrigue) X Spacecoast Sea Shells) 20 buds on 4-way branching. Reblooms. 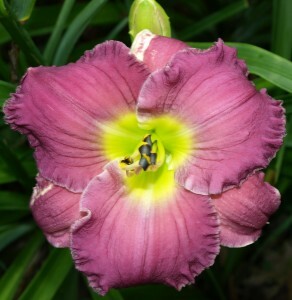 Jolly Lavender Giant is a large lavender pink with a ruffled double edge and no eye. Its edge is dark lavender with gold trim. The petals, as well as the chartreuse outside green throat, are accentuated by radial grooves. Rock-hard substance makes JLG a delight from early morning to after sunset. Fertile both ways. This 6.75″ beauty is Ron’s best introduction to date. Its substance and length of bloom day is remarkable. It should be a good parent for northern-hardy eye-no-edge daylilies and large gold-edged lavenders and pinks. (Ron Skinner, registered 2014, intro 2015) EM, Dor, Tet. H23, W 5.25, extended. Seedling A101 (Coldstream Guard X Musical Medley) 17 buds on 3-way branching. Magenta Mama is a rich bright lavender pink over a chartreuse throat and lavender-silver wire edge. Slight radial grooving enhances the petals. MM is fertile both ways, and a good parent. 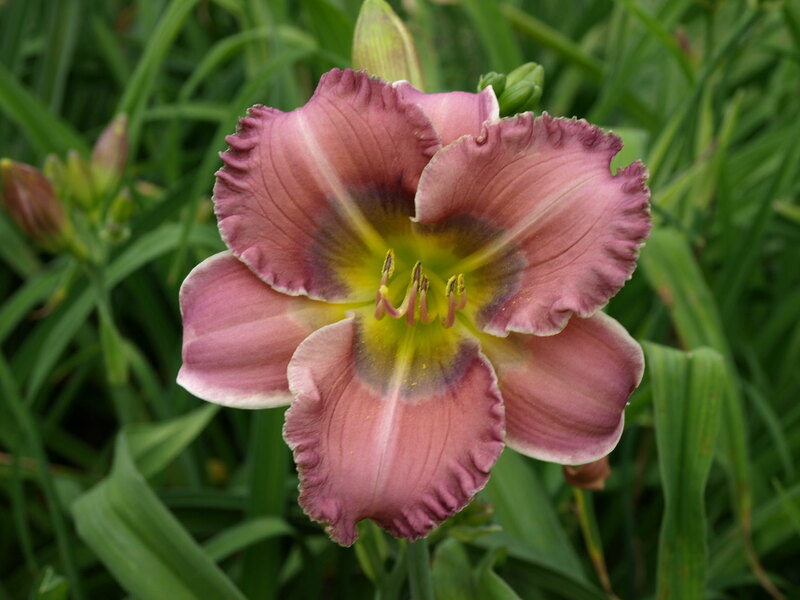 (Megan Skinner, registered 2014, intro 2015) EM, Dor, Tet, H 36″, W 5″, diurnal, bicolor. Seedling C119 (Earlybird Branched Brickey X Light Years Away). 29 buds on 4-way branching. Fertile both ways, but see note below on setting seeds on very tall scapes. Pomegranates Atop Lemons is tall, well-budded, bicolor, and recurved. 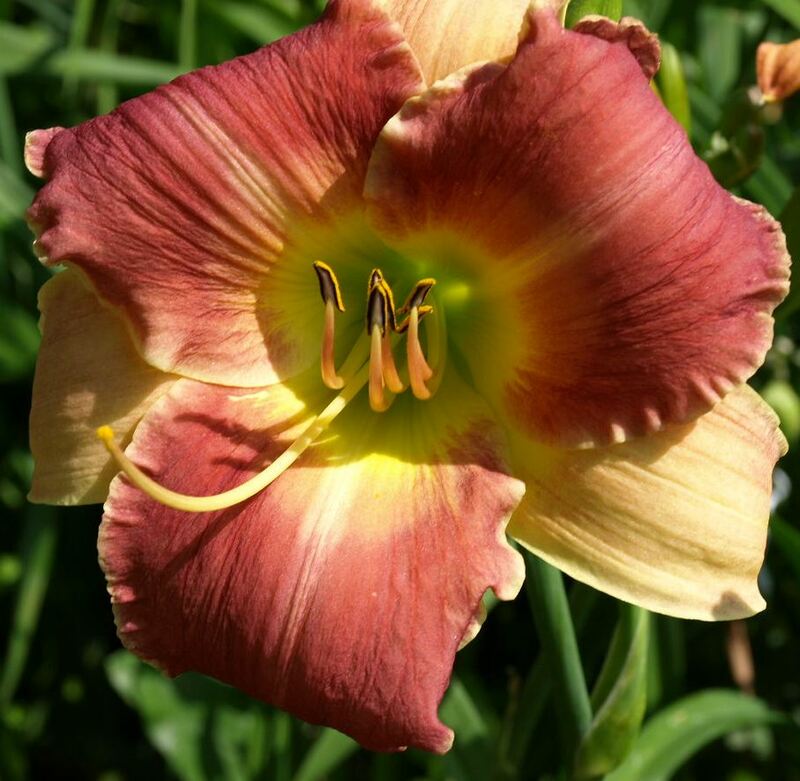 The base color is a light tone between lemon and melon; this color displays on the sepals, petal edges, midribs, and watermark. The rest of the petal is overlaid with light red, much the color of the outside of a pomegranate. Crossing Light Years Away, which is midseason and semi-evergreen, onto Earlybird Branched Brickey, which is extra-early and very dormant, ended up dormant but with bloom in the early-midseason, not early. 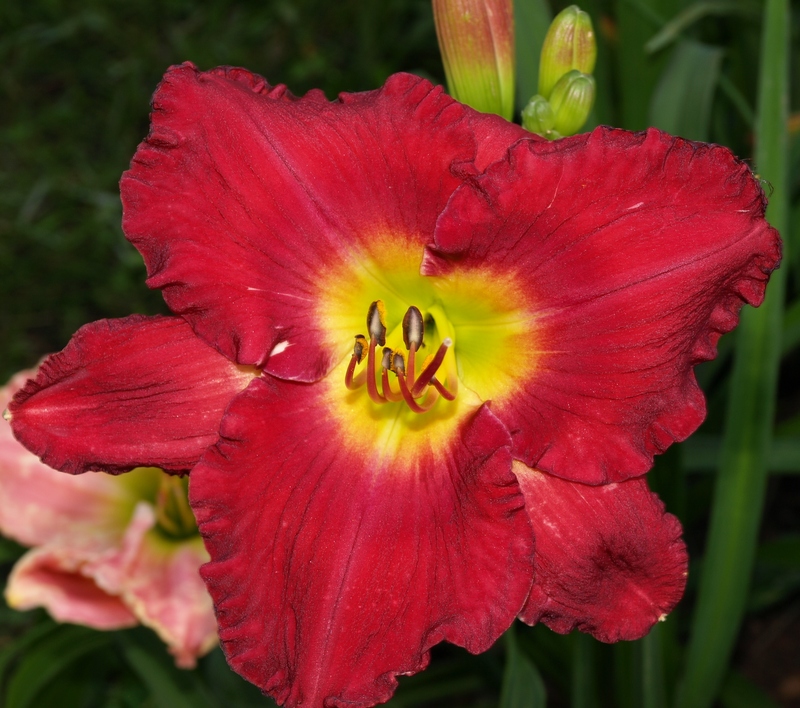 It is a nice addition to the daylily garden between the very early season and the start of midseason, and also a good bridge plant for bringing reds earlier and making very early but over-tender crosses taller and hardier. (Ron Skinner, registered 2014, intro 2015) M Dor Tet, H 35 W 4.75, bitone, diurnal. Seedling T02-042C (Debbie’s Vows X Light Years Away) 15 buds on 3-way branching. Fertile both ways. Medium dark pomegranate-red with ruffled gold edge, faint raspberry eye over light red and chartreuse watermark, and green throat. Sepals are light red with gold edges. Vigorous and clumps up well. (Megan Skinner, registered 2014, intro 2015) M Dor Tet, H 39″, W 5.5″, diurnal. Seedling C154 (Dan Mahoney X Joan Derifield) 15 buds on 4-way branching. Fertile both ways. Ready for Red has clear intense rose petals with a dark raspberry eye, which are separated by a deep red pencil edge. Further toward the center of the flower, the eye becomes medium-dark strawberry, and then blends into an orange transition to the chartreuse throat. The slightly ruffled petals have a double edge in raspberry and cream and a lighter midrib. In my effort to spread the range of daylily gardens by a full month earlier, red has been the hardest color – in nature, species reds bloom mid-late to late, and few hybridizers want to select for bloom season outside the midseason convention tours. 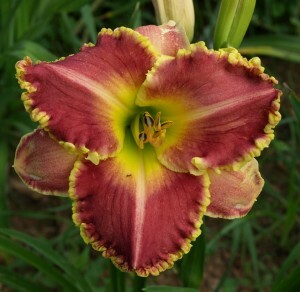 Ready for Red falls short of my earliness goal, but blooms right on the line between early-mid and midseason, making it a good parent for moving even earlier. Its intense and clear color also makes it a wonderful addition to the garden. (Ron Skinner, registered 2013, intro 2015) M, Dor, Tet, H 32″, W 5.75″, fragrant, diurnal Seedling C152 (Pinking Shears X Wren’s Song) Bud count 21 on 4-way branching. Excellent cold morning opener (CMO) and early morning opener (EMO). Sheared Gilt’s normal color is a slightly salmon pink, with a bright yellowish polychrome watermark. It is surrounded by deep gold toothy fringe. A highlight for northern gardeners is that it opens well in the morning, even on cold days. The lower photo was taken at 7:14 AM on a 54 degree (F) (12C) morning. The image illustrates the changes – the color is darker and less salmon, the watermark is dimmer, and the gold fringe is nice but not spectacular. Our zone 6 garden is often cool during bloom season, and we treasure the plants that keep blooming nicely during non-tropical weather. A good pollen parent with nice seedlings in the pipeline. Pods are possible but not easy. (Ron Skinner, registered 2014, intro 2015) M, SEv, Tet, H 30″, W 5″, extended. 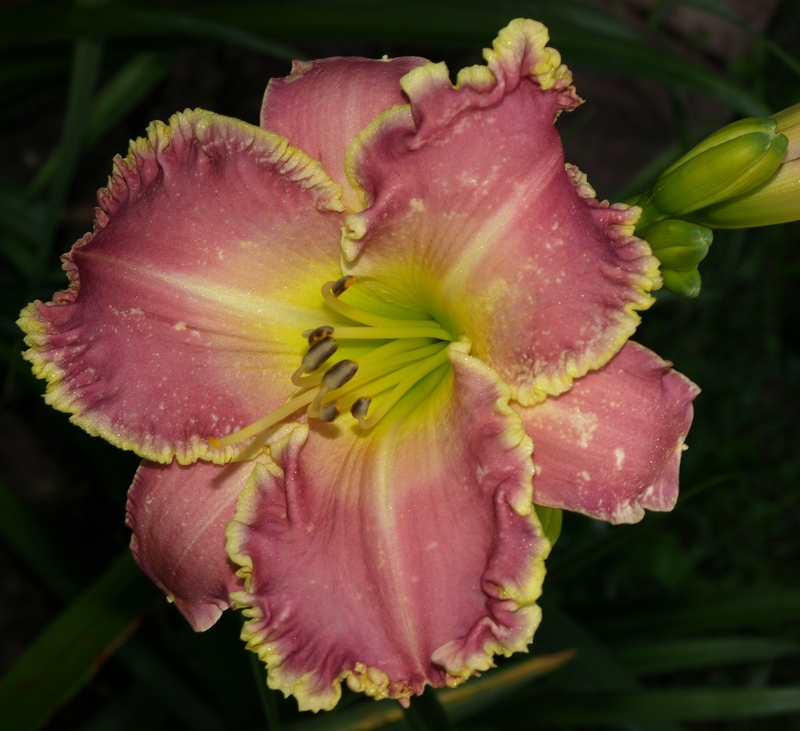 Seedling C179 (Diamond Dusted Borders X Gold Pressed Latinum). 23 buds on 4-way branching. Fertile both ways. Strong Shield is lavender pink with a somewhat diffuse lavender plum eye. The double edge of ivory and plum is slightly ruffled, the midrib is ivory, and the throat is yellow above green. It has excellent substance throughout the day and into the evening. (Ron Skinner, registered 2014, intro 2015) M, Dor, Tet, H 22″, W 6″, extended. Seedling T04-002-SpWh (Wedding Band X Fairest of Them) 11 buds on V branching. Fertile both ways. Near white with a dash of pink, White Sunlight’s chartreuse watermark, over green throat is accented by radial grooves on the petals. 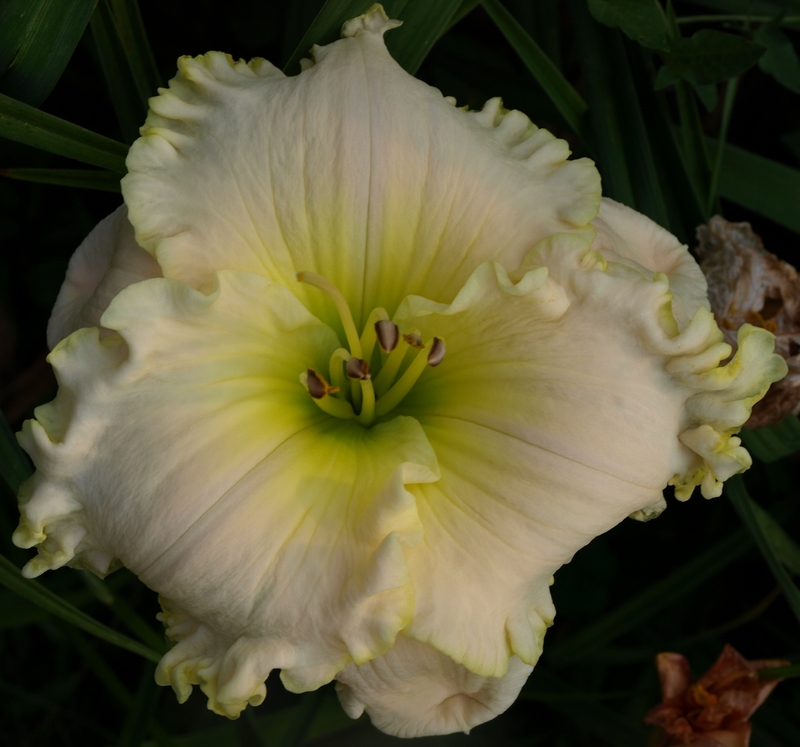 The heavily ruffled petals are edged in chartreuse. 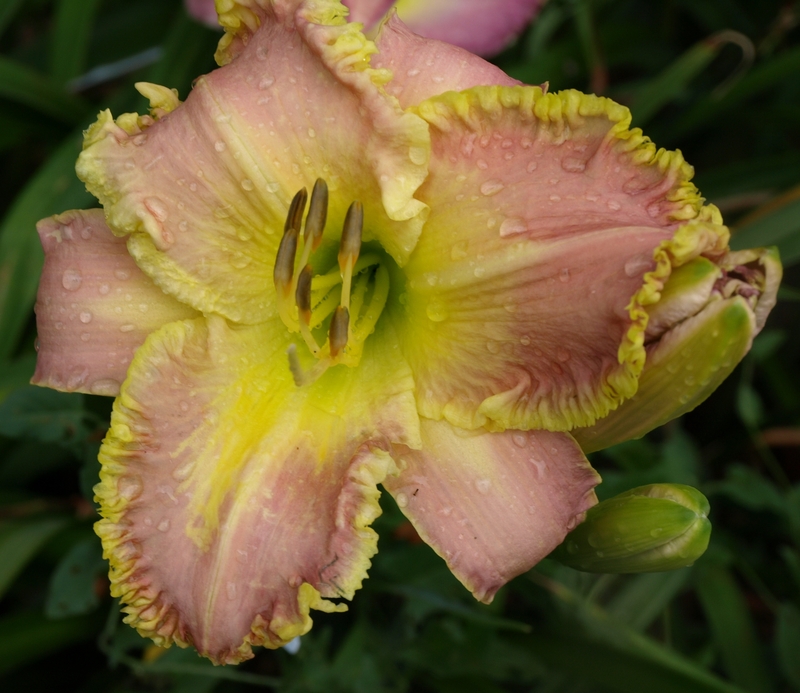 An excellent parent for ruffled daylilies, it passes along its large chartreuse eye and radial grooves. 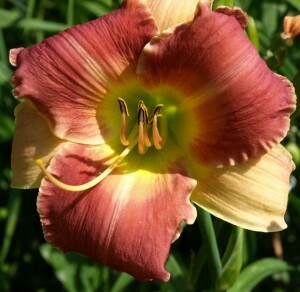 One day a strong wind blew over some of the scapes of Here’s Looking At You Kid, another of our very tall daylilies. (The same storm also knocked down a neighbor’s mature tree, so I didn’t think it was fair to downgrade HLAYK for leaning!) To our surprise, the historical non-setter produced fertile seeds. Since then, we’ve tried the same technique with other very tall plants, both dip and tet. Strong winds will do, but so will gentle bending, as long as you don’t crimp the scape. Our theory is that the infertility is caused by osmotic pressure being too low to transport nutrient-laden water to the developing seed pod. Those of you growing in well-irrigated soil may never need to try this technique, but those who share our clay soil and chancy rainwater environment might want to try it.